A friend of mine made a special request for a baby quilt and I was so excited to use Riley Blake's "The Sweetest Thing" fabric that I decided to whip it up this weekend. I used two charm packs along with one yard of Kona's "Unbuttered Popcorn" solid for the hourglass blocks and binding. The backing was pulled from my stash and is from Moda's out of print "Spring Meadow" line. Baby quilts are a nice break from all of my larger quilts and are always fun to make. 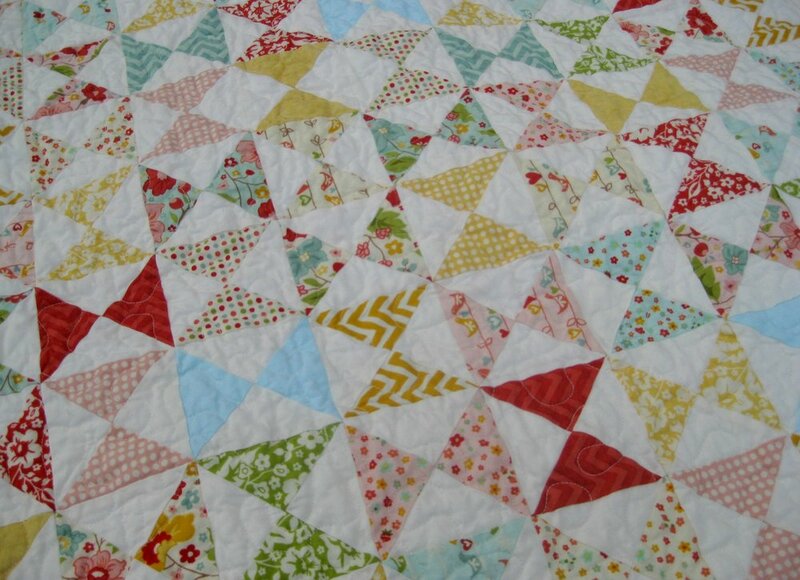 I just love these fabrics together and hope this quilt will be loved for many years by the new baby. I used Rita's machine binding method and was pretty pleased with the way it turned out on this quilt. I still prefer to hand bind my quilts, but this was nice for a quick turnaround project. Linking up with Megan at Canoe Ridge Creations.